Scarf measures approximately 74" long x 5 ½" wide. TLC® "Wiggles™", Art. E518 (3 ounce balls): 3 Balls each 423 Cherry CA and 209 Orange CB will make 2 scarves. GAUGE: 7 sts = 4"; 8 rows = 5 ½" in pat with 3 strands held together. CHECK YOUR GAUGE. Use any size hook to obtain the gauge. NOTE: Hold 3 strands of one color together and work as one strand in each row. NOTE: Always leave 6" ends when beginning or ending a color. With 3 strands of CA, leaving 6" ends before slip knot, ch 131. Row 1 (Right Side): Sc in 2nd ch from hook and in each ch across changing to CB in last sc; turn - 130 sts. Cut CA. Row 2: With CB, ch 2 (does NOT count as a st), hdc in first sc and in each sc across changing to CA in last hdc; turn. Cut CB. Row 3: With CA, ch 3 (does NOT count as a st), dc in first hdc and in each hdc across changing to CB in last dc (do not work into ch-2); turn. Cut CA. Row 4: With CB, ch 1, sc in first dc and in each dc across changing to CA in last sc (do not work into ch-3); turn. Cut CB. Row 5: With CA, rep Row 2 changing to CB. Row 6: With CB, rep Row 3 changing to CA. Row 7: With CA, rep Row 4 changing to CB. Row 8: With CB, rep Row 2, do not change color. Fasten off. Fringe: Cut two 12" strands each of CA and CB for each fringe (4 on each end of scarf). Fold strands in half to form a loop, insert hook from wrong side into fabric near other ends and draw loop through the fabric, then draw all ends of fringe and those from row ends through the loop. Tighten. Trim. 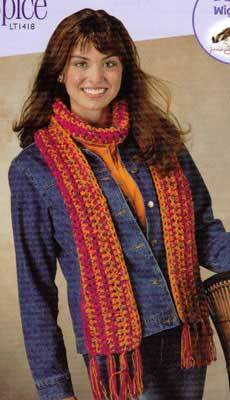 ABBREVIATIONS: beg = begin(ning); ch = chain; dc = double crochet; hdc = half double crochet; mm = millimeters; pat = pattern; rep = repeat; sc = single crochet; st(s) = stitch(es).